Rolling up for the big fight: Akhilesh and Mayawati. 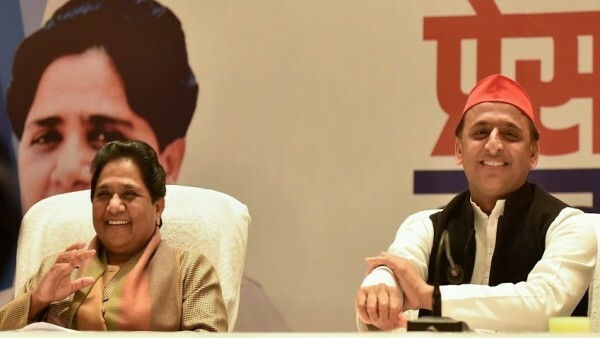 BSP supremo Mayawati on Friday taunted the BJP’s ‘Main Bhi Chowkidar’ campaign, two days after she accused Prime Minister Narendra Modi of changing his profile from ‘Chaiwala’ to ‘Chowkidar’ only to get votes in the Lok Sabha elections. “BJP leaders are scrambling to declare themselves ‘chowkidar’ (watchman) for appeasement but people like Uttar Pradesh Chief Minister Yogi Adityanath are in a fix on whether they should remain people’s representatives or become ‘chowkidars’,” Mayawati said in a series of tweets. “They are free to do whatever in any fashion but must be committed to the Constitution and the rule of law… This is what the people of the country want. “But in the process they (BJP) should not insult country and degenerate Constitutional posts in any way. Let Deputy Chief Minister (Keshav Prasad Maurya and Dinesh Sharma), Chief Minister and Prime Minister (Narendra Modi) remain as per the provision of the Constitution. They can do ‘chowkidari’ (job of watchman) after losing the elections,” the four-time Chief Minister of Uttar Pradesh added. Taking a dig at the government over the alleged theft of Rafale fighter jet deal files, she said that it was worrying that the union government was not allowing the release of data pertaining to employment, growing joblessness, increasing poverty, distress among farmers and labourers, just for the sake of losing votes and safeguarding their image. “After all these are the issues related to image and vote. Does the country need such type of ‘chowkidar’?” she asked. The BSP is contesting on 38 seats while the SP and the RLD are contesting on 37 and 3 seats in the state, leaving two to the Congress. Samajwadi Party chief Akhilesh Yadav told the Modi government not to pretend to be the Indian Army and said that governments which say they can’t be questioned are dangerous.